is an intensely bold blend of locally grown Bordeaux varietals—petit verdot, cabernet franc, and cabernet sauvignon—aged in French oak. It’s good young and gets better with time. And yes, its namesake is the famous song by a certain man in black who is honored with this blend. 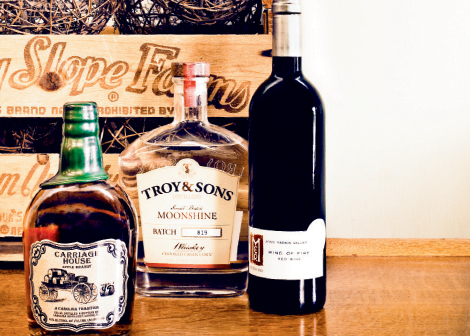 This small-batch moonshine from Troy & Sons Distillers in Asheville is definitely not backwoods. Silky smooth, but with just enough bite, this white lightning is cooked up in the finest Appalachian tradition, using pure mountain water and heirloom corn grown on a local family farm. Sweeten up any holiday feast with Carriage House Apple Brandy; It’s the real deal based on an old family recipe. This is a crisp concoction brewed from local apples and aged in new oak barrels inside a 110-year-old former carriage house in Lenoir. Each bottle is hand-numbered and signed, so accept no substitutes.